Remember I told you guys I was going to spend the next few weeks reviewing some of my party serveware? Well, we talked about those Daily Chef Beverage Dispensers last week, and this week I’m switching to the dessert table. 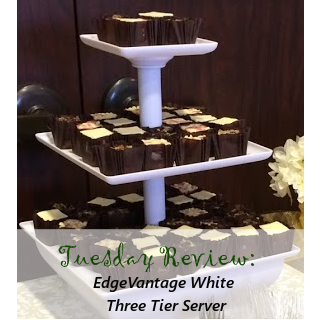 More specifically, to this EdgeVantage White Three Tier Server Station. This one is another big winner for me! Did you guys see it on the dessert table at the 50th anniversary party we had last week-end? It held almost an entire box of 63 bite-size cheesecakes and it looked amazing. It all stores in that big bottom piece. It even has little slots for the pillars to go in so nothing gets jostled around. It’s a heavy white plastic which means (a) my kids I can’t break it and (b) it’s super-easy to clean. Even though it’s plastic, it looks really elegant on any table. 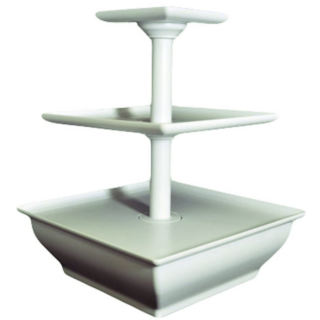 You can use it as a one-tier, two-tier, or three tiered server, and assembly is really easy. The base is leak-proof so you can put ice in it once you have all the pieces out, and then use the bottom tray for fruit or cheese or anything you’d like to keep cool. It’s less than $20! At the time of this posting, it’s $17.50 plus free shipping on Amazon. The only con to it is that it’s not a bit larger. It would be great to put cupcakes on, but it would probably only fit about 24 cupcakes or 22 and a smash cake on the top. It was the perfect size for the mini brownie-bites and cheesecake bites we picked up from Sam’s. Free Movie Ticket at Target WP of $5 DVD/Blu-Rays! Last Days to Shop SAS at Bath & Body Works + $20 off!